I told myself this month I was going to do a lot of baby knits. 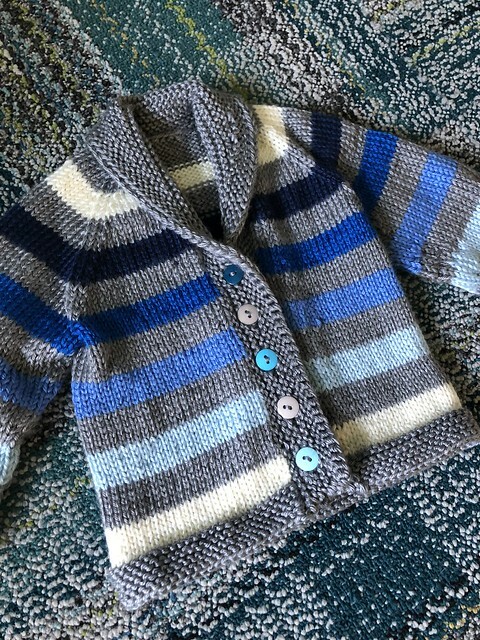 Whenever I have repeat presenters to my courses I knit them something and two of them have children, so I knew I was going to knit this toddler cardigan for Cait’s 18 month old, Graham. And my friend’s little boy Eli is 3 days younger than Graham and I promised her he’d get a new sweater. Add on another presenter has a newborn and one of my favorite people just had her second daughter (you will remember her first daughter and dog in matching sweaters) and I’m itching to make coordinating knits for the trio. But first up, the toddler sweaters I just finished! Let’s start with Graham’s in a glorious green. Both sweaters were made using the Child Sophisticate Pattern (I’ve made so many of these) using Caron Simply Soft yarn. For Graham’s I went with their cool green color since he’s got light blonde hair and blue eyes. I thought it would go great with his complexion (it did). I knit both in the 18 month size and his fit perfectly! I went with rainbow buttons for a bit of fun with such a bright and vivid green. I love the Simply Soft yarn because it washes and dries beautifully and is so soft. For Eli’s sweater I told his mom Leah she could send me some inspiration. 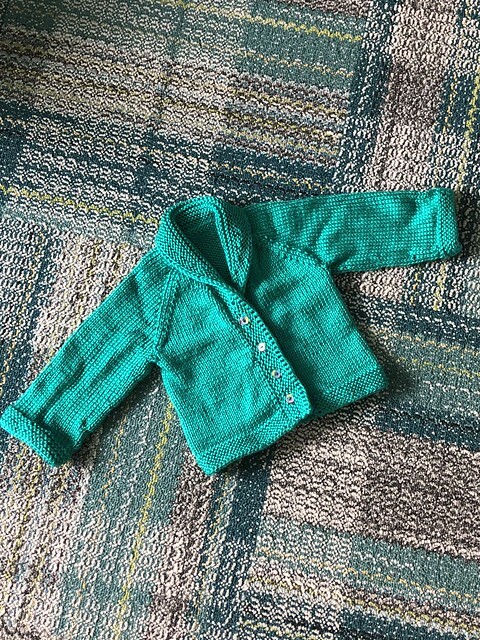 She sent me a link to this Baby Gap cardigan and I pulled through my stash of Simply Soft and this is what I was able to create. Pretty good, right? I love when inspiration turns into such a great piece of knitting. I didn’t get to see it on him but Eli’s about the same size as Graham so I’m not worried about fit. And for the buttons I mixed up the blues and greys I had in my stash for a fun mix. I can’t wait to see this one on him too. 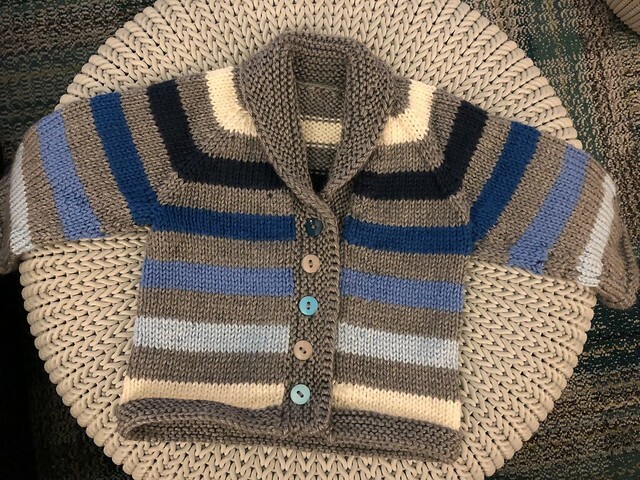 I love making knits for kids, they’re just too cute. 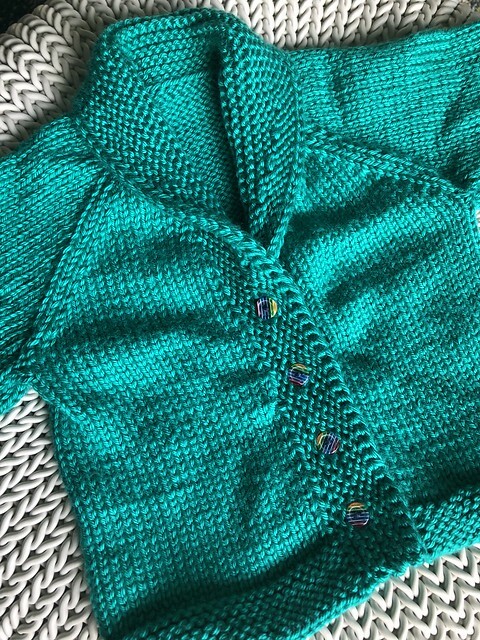 I love these cardigans😍 I went to your Ravelry page last week to find the pattern when you posted the green one. It’s in my que now!! But do you think it’s too masculine for a girl-my year old granddaughter? Not at all! I’ve made them for girls without the shawl collar or with (I love a good shawl collar myself). Stunning! I absolutely love the Cardigans and the color work is simply beautiful. Your such an inspiration! I am unfortunately still shying away from anything larger than doggie sweaters (which I love to do!). 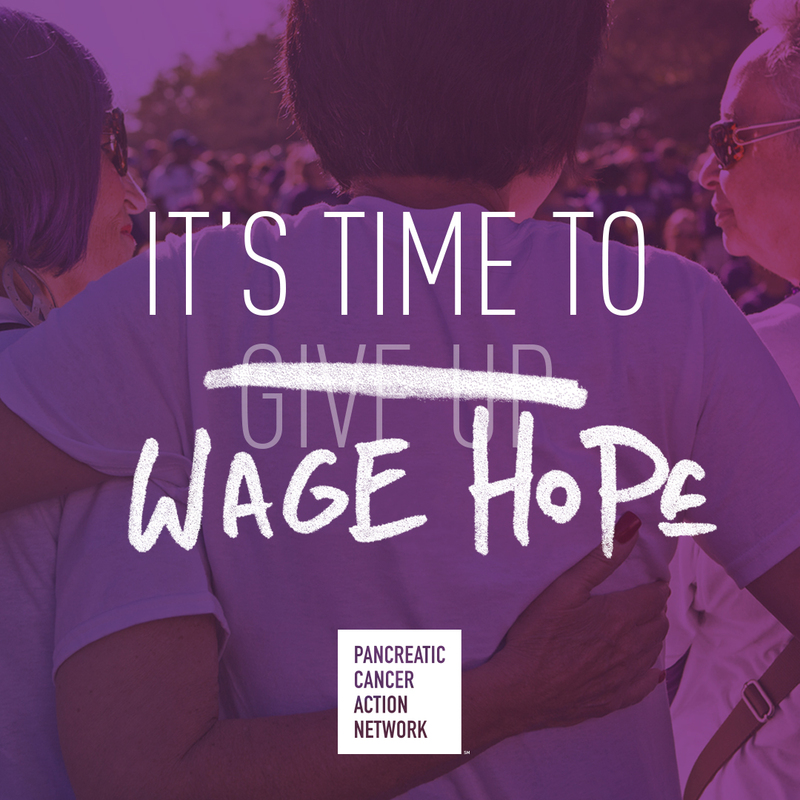 I guess I’m intimidated by seaming it all together….I love your passion and enthusiasm. I need some of that!! Lol…. These were top down and no seaming. And just as easy as a dog sweater ☺️ you should give it a try! Thank you! I will give it a try!! Your multi-colored buttons have it all over the plain black ones on the Baby Gap one! Such creativity!! 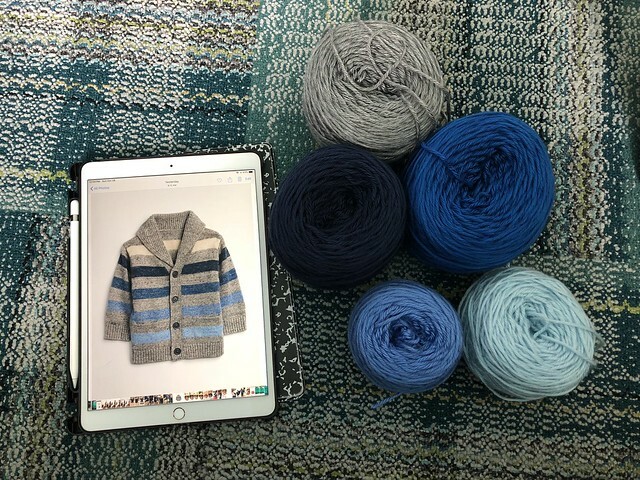 You have inspired me — I have a couple of babies to knit for at work and have been procrastinating because I didn’t t know the gender — I am making the gap inspired with rainbow stripes and digging into stash.